We are now well into July, and as we expected, triple digit temperatures have arrived in the Granbury area. The National Weather Service has issued a heat advisory, and we’re looking at 100 degree temperatures for at least a week or so. This is the reason we at Daffan Cooling & Heating have spent the past month reaching out to our customers, checking out their systems and preparing them for a hot summer. The alternative–going without air conditioning–can be a miserable experience. And for our elderly or infirm neighbors, it can be dangerous. A few news stories confirming this risk have been making the rounds. In Las Vegas, Nev., Shane Knight said he passed out and had to go to the hospital when the temperature soared in his apartment. He said he had been unsuccessful in getting the property managers to keep the building’s air conditioning unit running. “I couldn’t remember my name. I didn’t remember what year it was. I didn’t know where I was,” Knight told 13 Action News, describing how he lost consciousness in the overheated apartment. Long Beach, Calif. also has been hit by an unusual heat wave. Residents of the coastal community often make it through summers without air conditioning, relying on ocean breezes to keep cool. But this summer has been different. 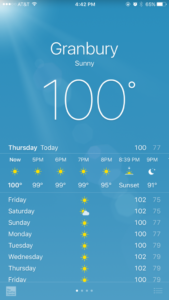 “The summers lately have just been horrible (with) 100 degree weather and with all the windows in front it’s like an oven, it just bakes us in. There’s no cross breeze,” said Ericka Gustafson, a Long Beach resident who has been living without air conditioning, in an interview with CBS2. Officials advise residents without air conditioning to get out of the house and head to public areas like libraries, senior centers, malls and indoor shopping centers, and public pools to escape the heat. Another option is to head on over to a friend’s house who has air conditioning. Also, be sure to check in on elderly neighbors or others who may be unable to leave the house during the heat wave. Whatever you do, be safe! And, call us any time you need us. Our phones are answered 24/7 by a real person, not voicemail!